If you have ever fancied writing your own games on your own gaming console, this tiny Hackvision gaming system is definitely worth a look. 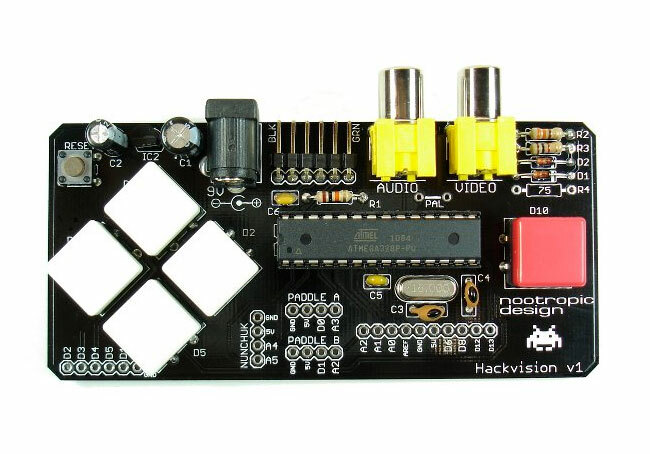 Hackvision is a simple, retro gaming platform based on Arduino technology that allows you to connect directly to your TV and run your very own own games and make your own controllers. Watch the video after the jump to see it in action. The whole project is open source with source code, schematics and board designs available. The Hackvision can either be purchased assembled for $47.95 or in kit form for $37.95 from the Nootropic Store and comes pre-loaded with 2 games: Space Invaders and Pong. NO Arduino is required as it is based on Arduino technology so you can write your own games and upload them using the Arduino IDE, all you need is a USB to TTL serial cable or adapter. It connects directly to your TV with standard RCA connections. One for audio, one for video. Works with NTSC or PAL (Europe, Africa, Asia, South America) TVs. Supported Controllers: Wii nunchuk, SuperNES, or paddle controllers you can make from a potentiometer and button. Or invent your own.